RGB backlighting, on the other hand, is less practical and mostly in demand for aesthetic purposes. The goal being to appear as flashy as possible so they might draw attention from potential buyers. Today I am reviewing the Redragon K553-RGB USAS, a TKL (TenKeyLess) mechanical keyboard that follows both these trends with omission of the numpad and addition of per-key RGB LED backlighting. The Redragon K553-RGB USAS (affiliate link) came packaged in a colorful art box with a holographic logo, multiple graphics and images of the keyboard on both the front and back of the box, along with descriptions of the more noteworthy features in many languages. Inside we find only the essentials. Contents include the mechanical keyboard, multi-lingual manual in a plastic baggie and a plastic ring keycap puller (red). Packaged safely to prevent damage during shipping. The board was stored in a bubble wrap bag with cardboard spacers around every edge for protection during shipping. The cardboard spacers are hollow with pieces of styrofoam inserted inside to further reduce the risk of damage during transport. Overall Redragon has done a very nice job with the packaging and presentation. The Redragon K553-RGB USAS is a TKL (TenKeyLess form factor) mechanical keyboard with 87 keys in standard ANSI layout. The entire board is completely standard, meaning there’s no odd sized keys that would prohibit the use of replacement/custom third party keysets. As for physical dimensions, it weighs 1 pound 10.9 ounces and measures 14.25 inches (length) by 6 inches (depth). There are 12 media keys in total, all located under a secondary Fn layer of the F1-F12 keys. The F1-F8 keys can be used to open your media player, adjust the volume (raise, lower or mute), pause, play, rewind and fast forward. The F9-F12 secondary functions will open your email, homepage, calculator and search. Being a gaming focused mechanical keyboard, the USAS features a Windows key lock and NKRO. The Windows key lock is activated by holding the Fn key and pressing the Windows key. The lock will be engaged and the Windows key will be unresponsive, a useful feature for gamers that prevents exiting a game if you accidentally press the Win key. The lock is disabled in the same manner, by again holding the Fn key and pressing the Windows key. Redragon has installed two red LED indicators at the top right of the board for the Caps and Scroll lock. Unfortunately, no LED indicator was included for the Windows key lock. That would have been handy. If you frequently use the Windows key and the lock you’ll likely lose track of whether it’s enabled or disabled. On the bottom the USAS has four small rubber pads for traction and two rubber tipped, flip-out riser feet for positioning at a higher angle. The riser feet work great, but the other four traction pads are way too small. As you can see in the pictures they’re only about half an inch long and extremely thin. The board is fairly easy to slide on a smooth surface if not using the riser feet. It didn’t really cause me any problems while typing, but while gaming I tend to apply more forward force to a keyboard. Afterwards I would notice the left side had moved up on my desk an inch or so. I think larger feet would be needed to improve traction and minimize movement. The cable is an ordinary rubber sheathed USB cable with gold plated connector. It has a non-removable velcro cable tie and a ferrite choke is located near the connector to protect against EMI and RFI. Unfortunately, the cable is hardwired and not detachable. That’s probably not a huge issue for the average user, but I’m always trying out new mechanical keyboards. Having to crawl under my desk and route cables for hardwired mechs is a hassle. If it was detachable I could just use the same cable that’s already connected (assuming it’s the same standard and fits the port). The USAS makes use of Cherry style stabilizers for the larger keys. The stabs actually came pre-lubed. As a result, they feel smoother than most stock Cherry stabs without lube. Though mine did have a decent amount of excess lube that needed to be wiped away. The K553-RGB USAS has nice visual appeal. It’s all black with a brushed aluminum backplate and floating key design. The backplate is larger and overlaps over the bottom plastic shell with sections that are angled and beveled, giving it an industrial aesthetic. When looking from above all you see is the brushed aluminum. A stealthy, minimalistic look by nature that will blend end with well with most setups. Until the vibrant RGB backlighting is activated, that is. The legend font is yet another “gamer” marketed typography that tries too hard to look cool and edgy. It’s at least a little more subdued than the Magicforce 68 legends (normal arrow keys and the “A” actually resembles an “A”), so even if you aren’t a fan of these types of fonts (like me) it should still be somewhat tolerable. Redragon has added their own branding in the form of a plastic badge logo on the right side of the keyboard, above the arrow keys. I would have preferred this area to be left blank. The logo could have easily been added to one of the sides or the back. Other keyboard manufacturers have started to go this route with the location of their branding. The USAS is still a good looking mech and in my opinion it would look even better with a more inconspicuous logo placement. The Redragon K553-RGB USAS features per-key RGB backlighting. Not multi-colored LEDs in a static rainbow pattern that similar budget keyboards use and advertise as “RGB” when they actually aren’t. This is true RGB. The documentation related to backlight profiles is limited to only a couple pages. The manual is thick, but only because it’s written in multiple languages. It’s also a little hard to understand due to the formatting and broken English. After a little trial and error I managed to navigate all the backlight modes. They are summarized below. Fn + Insert: This backlight profile gradually changes from one color to another. Pressing Fn + Insert again after enabling the mode allows you to pause the pattern on any given color. Fn + Home: This key combination changes between 4 profiles. Pressing Fn + Home once starts a rainbow pattern of multiple colors that begins in the center of the keyboard and radiates outward. Pressing twice resulting in a similar pattern, but this one is reactive (only initiates when a key is pressed) and the colors appear random. Pressing a third time provides a profile that’s almost identical to the Fn + Insert mode, but the change in color isn’t gradual. It also starts with the center keys and radiates to the left and right. Finally, pressing Fn + Home a fourth time allows you to choose from 7 solid colors (white, red, blue, purple, green, yellow and turquoise). In this mode you can cycle through the solid colors by pressing Fn + Left/Right Arrow Keys. Fn + Page Up: This profiles switches between the 7 standard colors running from right to left or vice versa. The direction can be altered with Fn + Arrow keys and paused by pressing Fn + Page Up again. Fn + Delete: One of the better modes to show off the true RGB effect. This profiles lights up with RGB color gradients and moves in a wave pattern. Pressing once enables the profile and two times pauses the wave movement, allowing you to display a static/gradient RGB theme. Fn + Page Down: Single key reactive mode. When a key is pressed only that specific key lights up and it gradually fades off. Default is white and you can cycle through the 7 standard colors with each press of Fn + Page Down. Fn + End: This is the custom mode. Pressing once enters the mode, pressing again allows you to alter the color of every individual key (7 colors) to your choosing and pressing a third time saves the the custom profile. The Caps and Scroll Lock LEDs will flash red to indicate that pressing any key will change its current color. There are 4 brightness levels (not counting completely off) that can be set with the Fn + Up/Down Arrow keys. Some of the backlight profiles allow you to customize the speed of a pattern with Fn + “-” (slower) and “+” (faster). Mounted to the backplate we find Outemu branded Blue switches, a MX compatible clone of Cherry MX produced by Gaote. They’re tactile clicky switches with a slightly heavier actuation force than authentic Cherry MX Blue switches. A bit of an odd choice for a supposed “gaming” mechanical keyboard as the USAS is advertised. Of the three main switch types (clicky, tactile and linear), clicky switches are generally considered the least ideal for gaming. Still, it’s mainly personal preference. Almost any mechanical switch will perform ok for gaming. Though in my testing this particular Gaote manufactured Blue switch seems to have little to no hysteresis. That’s a good thing, since many gamers do tend to avoid switches with excessive hysteresis. Where these switches do excel is typing performance, with outstanding feedback and tactility. They’re pure joy during long typing sessions. Outemu Blue switches produce a louder, less high pitched click in comparison to their Cherry MX counterpart. The tactile bump also feels somewhat larger and more pronounced. Those minor differences could be either a good or bad thing, depending on your personal preferences. As far as the feel and sound are concerned, I personally don’t view one as better than the other. They’re just different. I do favor the build quality of Cherry MX. The Outemu housing in particular feels less sturdy. I have no facts to back that up, just the general appearance and thickness of the plastic. The quality of Cherry MX switches has been proven through decades of testing and use. Outemu and most other MX clones are new to the market, so their long-term durability has yet to be ascertained. The housing of these Outemu switches is transparent. This was a good decision. The transparency prevents large portions of the RGB backlights from being directly blocked and helps disperse the lighting more evenly. It produces a bolder, more defined illuminated legend without the patchy spots of lower brightness you often see with backlit keycaps. Thanks to the floating key design the mech also looks wonderful from a side profile with the switch housings completely lit up. Overall Outemu/Gaote has created a decent budget switch as an alternative for when the price of real Cherry MX is prohibitive. That’s the case here, as “downgrading” the switches is the only way Redragon was able to create a TKL mechanical keyboard with per-key RGB backlighting for $60. Otherwise the K553-RGB USAS would come with a retail price much closer to $100. The only concern I have is the board only being available with clicky switches. Linear switches of any kind aren’t even available as an option. The USAS’s stock keycaps are reminiscent of those found on the Magicforce 68. In fact, they’re almost identical. The USAS’s sculpted, OEM profile keycaps are constructed of doubleshot ABS, with black ABS for the main keycap body and translucent for the primary legends, allowing them to be illuminated by the RGB backlighting. Always nice to see doubleshot keycaps being used on budget mechanical keyboards. They’re crisp, high-contrast, blend in with the keycap (doesn’t alter the feel like pad printing/laser etching) and much more durable. The result is a legend that won’t fade away from wear, even after years of heavy typing. However, the secondary legends are pad printed. They will be susceptible to fading, though secondary legends are only found on keys that will generally see limited use (F keys and navigation cluster), so it shouldn’t be much of a issue. The thickness of these keycaps is on the thinner side. Somewhere between medium thickness and “Oh look, that keycap is made of paper!”. The surface of the keycaps have a light matte texture. They almost feel smooth to the touch. As you would expect, homing bumps are located on the F and J keys so touch typist can easily position their fingers without having to look at the keys. For stock keycaps on a low budget mech I find them completely acceptable. I see no reason you would need to immediately replace them for something better, but wouldn’t blame anyone that did. The brushed aluminum backplate not only looks sleek, it really helps to stiffen the entire board. It’s a fairly substantial piece of aluminum, to the point there’s basically no flex when applying moderate tension to each end of the board or pressing down firmly on the center. Only the backplate is aluminum. The bottom shell is molded of ABS plastic in an effort to keep the price low. It’s a good compromise, as the aluminum backplate is more than enough to add needed rigidity and weight to the board. The decision to use Outemu Blue switches might seem a little strange since Redragon classifies the K553-RGB USAS as a “gaming” keyboard, but that all boils down to personal preference. The typing experience is sublime, and not everyone prefers linear switches for gaming. Not to mention this particular MX clone switch displayed little to no hysteresis, unlike the Cherry designed MX Blue. There should be no issues with double-tapping. The biggest complaint I have is with the small rubber feet that provide minimal traction. The lack of a detachable cable is also annoying. I’m constantly switching out keyboards, so it can be frustrating not being able to just unplug one mech and use the same cable with another. Also note that Windows 10 and this keyboard weren’t exactly Plug & Play. I initially experienced a minor software issue that wouldn’t allow the keyboard to register any keystrokes with the driver that Windows 10 installed by default, but it turned out to be an easy fix. It’s rugged construction should hold up well with abuse and the floating-key design mixed with a brushed aluminum backplate in blackout motif is visually appealing, especially for those into showy RGB backlighting modes. If you don’t care for RGB I recommend you save a few bucks and go with the regular K553 version instead. It only has a single color backlight (red). Beyond that one difference it’s the same keyboard, only cheaper. All that being said, the Redragon K553-RGB USAS is a decent choice for anyone who desires a low-budget TKL mechanical keyboard with per-key RGB backlighting. It currently retails for $60. Despite a couple of criticisms, I don’t think you’ll find a better TKL mechanical keyboard with true RGB backlighting for less. True RGB backlighting on a budget. Brushed aluminum backplate looks nice and adds structural integrity. Outemu Blue switches perform better than expected, feel satisfying to type on. Great value at such a low price point. Decent amount of built-in backlighting profiles that don’t require additional software. Sturdy construction with solid build quality. Possible driver conflicts with Windows 10, simple fix. Cable is hardwired (not detachable) and isn’t braided. Many will find the legend typography unattractive. Another flashy gamer font. No switch choices, only available with Outemu Blue clicky switches. The four main rubber feet are too small, less traction when not using larger riser feet. Though it has internal hardware to store backlight profiles, there was no software included; backlight customization options are somewhat limited. 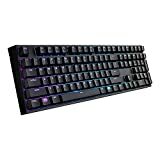 At the time of writing this review the Redragon K553-RGB USAS TKL mechanical gaming keyboard was available from Amazon. Wow, dude, you just sold me this keyboard! Your article covers everything that could asked about a keyboard, even some details I didn’t know one should check when looking at a mech-keyboard, since I have yet to buy my first one. The K553 looks like a good entry point before getting used to mechanical switches and committing to a pricier big name brand, specially on the limited Argentinian market.